Make this your lucky day at Fair Go Casino with a 400% first or second deposit bonus and 25 free spins on the Paydirt pokie slot. Redeem the bonus code CMC400PD before your next deposit of $20 or more to claim your bonus up to $400. This special bonus was found in the casino cashier message center and could expire any time. Check your message center for personalized bonuses and weekly free spins. Good luck! $5 Free Chip for New Players: Register your new Fair Go Casino account after clicking the banner below and then redeem the coupon code FAIRGO5 in the coupon section of the casino cashier to claim your $5 free chip, no deposit required bonus. Please read the bonus terms and conditions on the casino's website before you play. Minimum deposit $20; No max cashout; Maximum bonus amount is $400. Slots wagering requirement applies. Redeem the coupon code prior to depositing. Please note, this bonus can only be applied to your first or second deposit at Fair Go Casino. Terms: The minimum deposit is $20 | No maximum cashout | Maximum bonus amount is $300. Please note, this bonus can only be applied to your first or second deposit at Fair Go Casino. Valid for new noluckneeded.com players who register after clicking the banner above. Standard free bonus rules apply. $50 maximum cashout. 60x wagering. $10 Maximum bet rule applies. Deposit Monday to Thursday and Get 30 Free Spins every Friday! Free Spins Game: God of Wealth. $50 minimum deposit. Standard free bonus rules apply. 60x wagering. 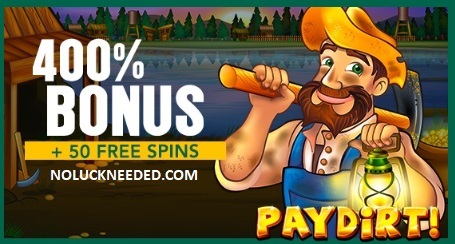 Claim your Paydirt Free Spins and 400% Bonus at Fair Go Casino! Fair Go Casino is a RealTime Gaming software online casino and the newest member of the award-winning Deckmedia Casino group. FairGo Casino is specifically tailored to the Australian market! The SlotoCash Group (Deckmedia) is well known for top notch 24/7 customer support and reliable, prompt player payments. Click here to read and share Fair Go Casino reviews, ratings, or complaints in the NoLuckNeeded Casino Directory. Bonus Restricted Countries: Players from the following countries do not qualify for the free no deposit bonus: Albania, Armenia, Azerbaijan, Belarus, Bosnia and Herzegovina, Bulgaria, Croatia, Hungary, Indonesia, Kazakhstan, Kyrgyzstan, Latvia, Lithuania, Mauritius, Macedonia, Malaysia, Moldova, Montenegro, Poland, Romania, Russia, Slovakia, Slovenia, Tajikistan, Turkmenistan, United Kingdom, Ukraine, Uzbekistan. Here's another code for Fair Go.